The road trip comedy The Long Dumb Road directed by Hannah Fidell that World Premiered earlier this year at the 2018 Sundance Film Festival will open theatrically in NY on November 9th before expanding to LA and other cities on November 16th. The Long Dumb Road stars Tony Revolori, Jason Mantzoukas, Taissa Farmiga, Grace Gummer, Casey Wilson, and Ron Livingston. From writer-director Hannah Fidell (A Teacher, 6 Years) and co-writer Carson D. Mell (“Silicon Valley,” “Tarantula”) comes a comedy of transformation, discovery and maturity set on the road between Austin and Los Angeles. 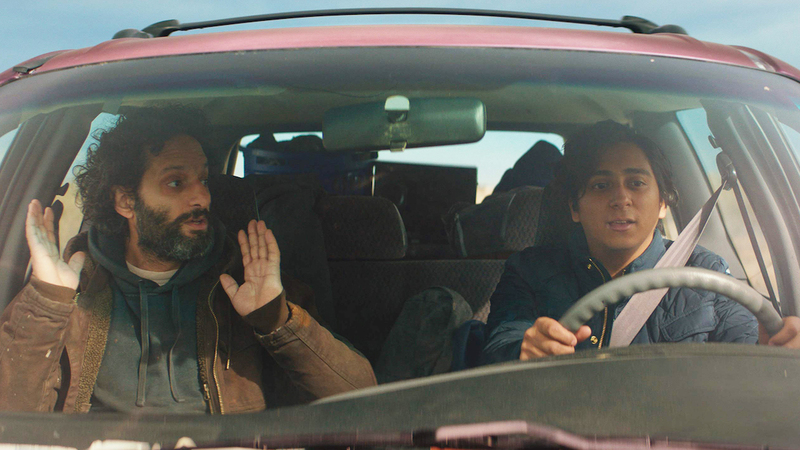 When college-bound teenager Nat (Tony Revolori) offers itinerant 30-something mechanic Richard (Jason Mantzoukas) a ride during a stop-over in small-town Texas, neither one realizes the indelible impact each traveler will have on his respective journey. Nat, an aspiring photographer, is heading towards a bright future in art school in Los Angeles and wants to find the real America en route to new beginnings out West; Richard, a lovably unkempt motormouth, is simply looking for connection in the moment — and maybe a beer or ten — while he grapples with indecision, past mistakes and dead-ends. As they travel through the American Southwest, taking in picturesque towns and crossing paths with an assortment of old flames, fellow travelers, kooky cons, and Good Samaritans, both passengers come alive through the myriad possibilities of the open road. Finding connection, comfort and chaos in their shared journey, this improbable and unforgettable screen duo forges an epic bond few will forget.